Posted on October 10, 2013 October 10, 2013 by Daniel McNally	This entry was posted in Economics, Politics. Bookmark the permalink. Read this with interest and lots of re-thinking my current conceptions. 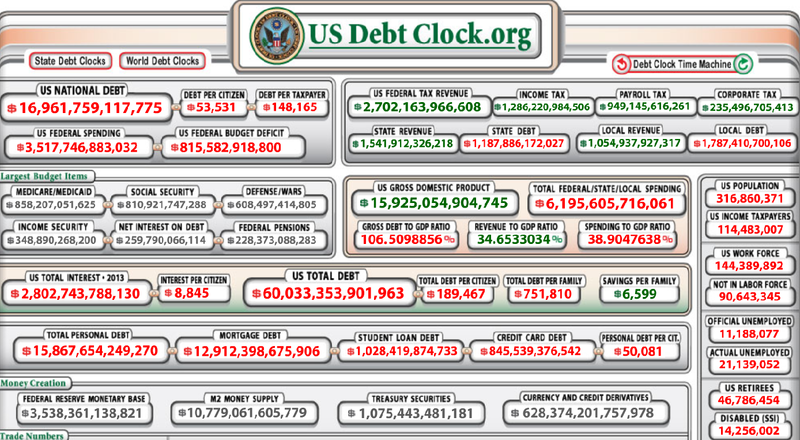 I certainly thought the size of the debt number mattered, and you are arguing that it does not. Doesn’t the fact that 26% of our debt is owed to China mean that the size of that number matters? We have to convince them to take our tickets. It seems like in addition to inflation within the country, relative currency value matters and you didn’t address that in this article. I could’ve gone on to related matters, like the trade deficit with China, but I didn’t want to make this too long. What’s important to keep in mind about the US debt that China holds, is that the debt merely represents dollars. The only difference between the Chinese holding $100B in US dollars and $100B in US treasury bonds is that the treasury bonds have a present value of slightly less than $100B US dollars. The Chinese could, if they wanted to, “cash in” their debt holdings at anytime by selling them for dollars on bond exchanges. The only difference between the Chinese holding US debt and US dollars is that the debt pays a bit of interest. What can they do with dollars? Buy goods and services – just like anyone else can. They could all decide to start buying American cars and gadgets, taking vacations in the US, etc… Is that really a bad thing? The unemployed and the struggling American businesses probably wouldn’t say so. In reality, we have no problem in finding demand from China and elsewhere for our tickets. We have a large, ongoing trade deficit with China and people act like this is a bad thing. We send them tickets, and they send us clothes, cars, electronics, appliances, and other things of real value that improve our standard of living. China has a relative advantage at producing these things compared to the USA, and trade with them frees up American labor to do the things which we have a relative advantage at, as well as allow Americans to work fewer hours while enjoying the same or higher standard of living. That sounds like a great deal, and in reality I think it is. Yet people act like the trade deficit is a terrible thing that’s putting Americans out of work. As I see it, it’s the failed and misguided economic policies of our policymakers that bears most of the blame for Americans being out of work. Our private sector can’t afford to hire willing and able workers and our public sector is tightening its belt even when there are legitimate needs (like improving education, increasing access to health care, and fighting poverty) that our society wants from its government. The purchasing power of our currency is an important consideration, but it doesn’t come before the actual productivity and well-being of our society. And while increasing the money supply does put downward pressure on the purchasing power of the dollar, increasing our productivity (as we could easily do in times of high unemployment) would have the opposite effect. I’m a bit concerned arguments like are ignoring problems inherently caused by inflation. What happens to the retired people with static money in a saving account. They start with 2 million (reasonable retirement savings) and 15 years later if they’ve spent nothing on living they only have 1/4 of their saving value (formual uses 9% inflation per year 2/3 of our historic high).In reality they’d have nothing left. I don’t mean to ignore problems potentially caused by inflation. Framing the debate over deficit spending as “will additional deficits cause more harm through inflation than good?” is intellectually honest, whereas framing it as “if we don’t cut the deficit we’re gonna go bankrupt and get owned by China!! !” is decidedly dishonest. In the situation we’re in now, my understanding is that worries over inflation are greatly exaggerated. We experienced deflation for much of 2009, and since then we’re experiencing relatively low inflation rates of 1-3%. But I think the key thing to keep in mind is that inflation is essentially a transfer of purchasing power from holders of money to earners of money, not a destructive force in and of itself (although hyper-inflation can certainly paralyze an economy). Unemployment, however, IS a destructive force. When people are willing and able to produce for society, but are unable to, society doesn’t get to enjoy the fruits of their labor. Consequently, reduced production causes the purchasing power of the dollar to go down. Remember, retired people don’t need money to have a happy retirement. What they need is food, entertainment, health care, and other real things than an economy produces. If our economy produces less of those things, there’s less that’s available for retirees. When deficit spending is causing inflation but not improving the productivity and well-being of society, that is when I would rein in deficit spending and consider increasing taxes to stabilize the dollar’s value. As for unintended victims of inflation, they can be addressed with other policy changes. Increasing social security benefits for retirees can ensure that those on fixed income still have access to a standard of living that we as a society deem acceptable, for example. The only difference between Merrill Lynch and a Government under water, is that a government can print money as you pointed out in the original article. I address this is point 3. 3) As you said, we’re currently in an era of low inflation/possible deflation. It’s suggestive we’re experiencing this because we’re choosing to pay obligations by borrowing instead of printing (so the currency remains finite). The problem with bankruptcy is that it removes that option, and leaves only printing, which is where hyperinflation enters. 4) I agree that inflation transfers value to independent earners as they will be able to charge more for their goods/services. I’m worried that typical corporate employees which are the growing majority, will unfortunately not realize gains equal to inflation and will be almost as equally “boned” as the unemployed. The largest problem I see with this though is that we have 100-150 million people not working and they get “boned” (technical term) by inflation. 5) ” retired people don’t need money to have a happy retirement” The example I used of retired people assumed 2 people were able to live off 33k a year, but they lost 3/4 of their savings “value” to inflation (approximately averaged to 100k a year). I agree then that what we’re discussing IS people’s ability eat and pay for healthcare. Conclusion. I’d argue Rome collapsed not because of failed social policies, but because it failed to manage it’s finances and pay for it’s policies. 1) Correct. There’s no inconsistency here. Maximizing the value produced by a society should be the goal of economic policy. Inflation doesn’t impact production – goods or services produced are available to be consumed one way or the other. Unemployment represents wasted production. Tax cuts and/or increased government spending can put unemployed people to work, thus producing more goods and services for society. More goods and services for society means a bigger pie from which everyone in society gets a slice. My point is that we should focus on maximizing value, and obsession with debt and inflation among our policymakers get in the way of that. 2) This misses the point of this article. The government doesn’t require anyone to lend to it to continue spending dollars, and the only thing it owes to bondholders are dollars (of which it has an infinite amount of), just like Chuck E. Cheese’s does not need to borrow tickets to keep giving them out in their arcades. Merrill Lynch did not take on debts in its sovereign currency, the US does. That’s an extremely important distinction that is lost on most people. I tried to make that clear in this article, although I realize it’s not a very easy concept to grasp for the first time. 3) Issuing treasury bonds instead of dollars is not the reason that we experienced deflation, that was because we had a recession and financial crisis. That’s another complicated topic, which has to do with a shock to consumer confidence and demand (and when demand falls, prices fall). Issuing treasury bonds does create an artificial incentive to save and delay consumption in the short term, which tends to lower prices in the short term, but in the long term it increases the monetary base all the same. It’s important to consider that treasury bonds are equivalent to dollars on the date of the bond’s maturity. Issuing a treasury bond is effectively equivalent to issuing dollars in the future. There is no such thing as bankruptcy for the US government, because it can never run out of dollars. I’m not remotely an expert on Rome, but I think present day USA has plenty of failed policies as well. Tax increases and spending cuts in the face of a recession because of a misplaced fear over bankruptcy and debt are pretty high up there. DM- Your article was interesting because it reminds the reader there are 3 ways for a government to pay for items: taxes, loans, and currency printing. Regarding your point #2 above. I’d argue that while yes the government “could” print 0.9-1.3 trillion dollars per year, this is not what they’re doing. The Federal Reserve website currently estimates we only have 1.3 trillion in circulation total right now, however the annual deficit is estimated between 0.9-1.3. In the past 6 years if we were paying for it thru printing currency, we’d have almost 10 trillion total in circulation. Instead what we’ve seen is a debt ceiling increase from 9.5 trillion to going on 18 trillion, indicating that most of the deficit is rolled into debt. In response to “issuing a treasy bond is effectively equivalent to issuing dollars in the future.” Based on our low currency total in circulation relative to our debt, I would argue that historically and currently our main method of paying treasury bonds is by issuing more treasury bonds and paying the last investor with new ones. This is why I compared it to the Merrill lynch methodology. Your article is interesting in that it explores options. Please correct my currency total if I got it wrong but if we stopped borrowing all together and only printed currency to handle the deficit my concern is that we would double the total currency in one year, which I would expect would be a very bad thing for inflation (50%+ inflation rate). If this is remotely accurate, then option 3 (printing) is less of an option than we might have hoped. The first line isn’t entirely true. Before dollars can exist in circulation, they need to be spent (or printed, if you’d rather) by the government. 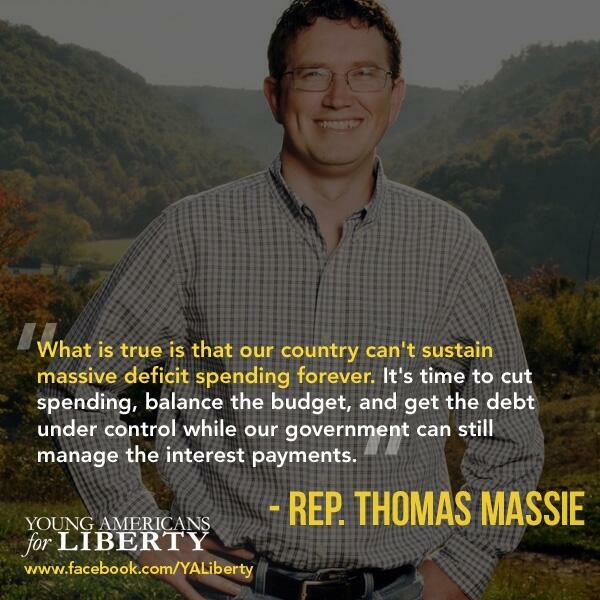 The government cannot tax or borrow dollars it has not spent. It can not only tax and borrow with a fiat currency. 1.3 trillion is the monetary base, m0, but what most people consider the money supply is m2, which is monetary base + short term deposits on banks. That is >10 trillion. Nobody believes we would experience anywhere near 50% inflation by increasing the deficit a few hundred billion or by having the Federal Reserve buy up even more treasury bonds in exchange for cash (as they already do with QE). But this is all besides the point. Money is not wealth. Low inflation rates in the present will not improve the standard of living for future generations. Only real goods and services that people value counts as wealth, and only real investment in productive and human capital can benefit future generations. When our economic policies result in huge amounts of waste, perhaps represented best by the millions of able but unemployed workers in our economy, that is the problem. That is what detracts from our wealth in the present and our productive ability in the future, and that is what I’d like to see our policymakers address. Not baseless fears of government insolvency. Great piece, Dan. The challenge with the analogy to Prez. Cheese is that there is no international consideration. Its just Prez Cheese isolated inside the Chuck. E. Cheese. What would happen if there was another restaurant across the street that traded with Chuck E Cheese and exchanged their dollars for tickets? I wonder why no politician has successfully adopted the platform counter to the “we can’t bankrupt our future generations” fear mongering and gained traction. You’d think people would be relieved to learn the truth which is far rosier than the thought of being indebted physically. Is a good analogy when a company issues its own shares as currency to fund an acquisition? For example, instead of using cash or debt, a public company may use its own shares, so the true cost is born by shareholders in dilution of shares outstanding. Is this analogous to what happens to fiat currency holders when the US government issues more deficit spending? Great thread between you and Craig, btw! Thanks again. The foreign entity trying to acquire tickets would only be able to use them to purchase goods and services traded in the land of Prez Cheese. It wouldn’t pose a problem, that’s just international trade. Voluntary international trade occurs when there exists relative advantages between two nations, and benefits both nations. 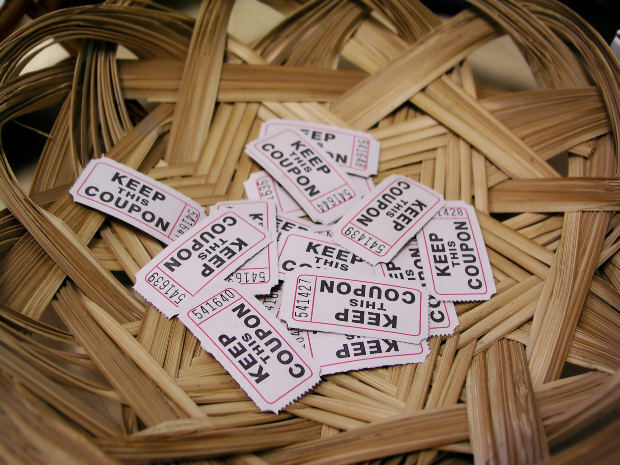 Domestic entities who acquire tickets would have the same use for those tickets, as well as paying taxes. I think the reason fear mongering works is because people respond to it, it riles people up and scores points in the voting booths. Look at the tea party movement, I don’t know if that gets off the ground without irrational fears over national bankruptcy, hyper-inflation, and/or Chinese takeovers. I wouldn’t say companies issuing shares is a good analogy to sovereign nations issuing currency. Even w/ companies, the shareholders don’t typically suffer. If company ABC is worth a million and has a thousand shares, the share price is $1000. If that company issues a thousand more shares and sells them at market price of $1000 each, then the company now has an extra million in cash holdings and is worth $2M and has 2 thousand shares, the share price is still $1000. A sovereign nation can use fiscal policy and deficit spending to recover wasted output that results from unemployment, effectively increasing economic output. Inflation is an increase in prices, or a loss in the purchasing power of each unit of currency. When total economic output is flat, and the money supply goes up, prices go up as well. When an increase in money supply results in an accompanying increase in economic output, as I (and many others) expect would be the case w/ more tax cuts and deficits, then prices won’t go up as much or possibly even at all. At the end of a day, a nation is only as wealthy as its economic output.